There is no solid ground when looking for reality. We guess, approximate, fabulate, hallucinate, habituate our being to what works most of the time, and get by. Whatever it is, we’re somehow sort of aligned with it, else we wouldn’t be here, individually and collectively, but the gap between our representations, most of them not consciously accessible, themselves based on the minute slice that we’re able to sense, as far as we know, which is not very far yet, I think, the gap cannot be bridged, I think. All of this is immaterial, which is a strange metaphor for what I want to say but appropriate, to the wanderings of my thinking, the workings of my attention. I read an article about a Dutch filmmaker, Masha Halberstad, whom I had never heard of, who made the clip for a new song of a British band I had never heard of, The Prodigy, of which I don’t particularly like the music. Halberstad talks about an early clip of the band that she thought the best ever. And I totally agree. A spectacular visual, disturbingly captivating. Being in Holland I do what I always do, check out both outlets of Nijmegen’s major bookshop, and I come across Consciousness, an Introduction, by Susan Blackmore, the first ever university textbook on this topic, which makes me think of my friend Han van de Boogaard, who did such a course for polytechnic students ages ago, and used Douglas Harding‘s headless perspective exercises for similar purposes as Blackmore. Very much the perspective of The Prodigy clip. Although that’s not why I noticed the book. The whole consciousness thing has been with me for ages, whoever that me may be, because that’s what the consciousness thing is all about. While we’re with Blackmore, let’s give her the floor a bit because she’s one of those fence-sitters like myself, science on one side, the introspective on the other. Anyway, she seems quite the hyperactive type, and an experienced lecture hall presenter, the tricks of the trade sometimes a bit too obvious, the seemingly spontaneous a bit too rehearsed, but nothing wrong with her analysis. She’s obviously had a long line of previous me’s honing the argument and tools of persuasion used. Marjan takes me to a new store in Nijmegen with an interesting concept, they rent out shelf-space to anyone wanting to sell something. The resulting collection of bric-a-brac, curiosa, second-hand market finds, developing country craftwork, home-made foods & drinks, and art work is all over the place, very cheap, and makes for a treasure trove exploration experience. 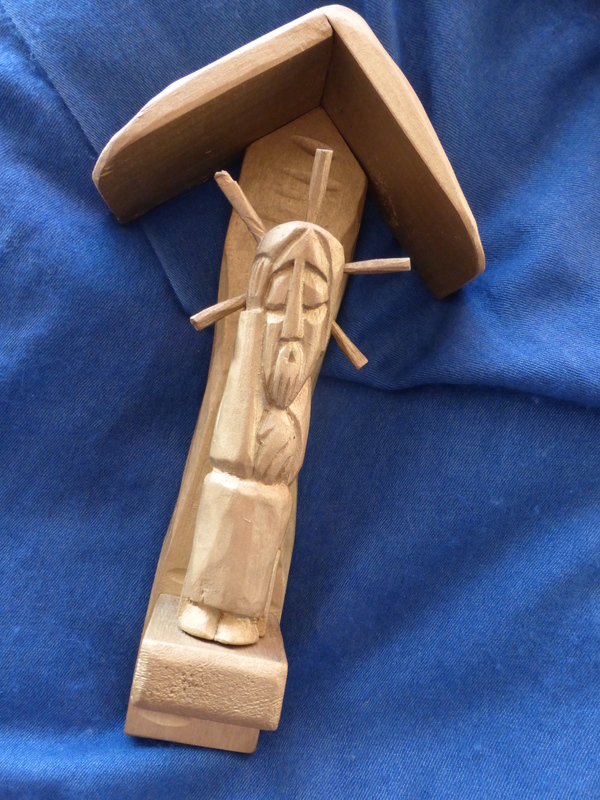 I find and acquire this piece of Polish woodcarving. Christ is not looking happy. But what does the aureole or halo (or is it a crown of thorns?) have to do with happiness? As the headless view has nothing to do with it. What does one hand supporting the head and one hand on the belly signify? It is clearly not a cross, more suggestive of a mushroom. But I’m pretty sure the wood carver wasn’t a Terence McKenna adept. Whatever the answers, taking on reality, in all its savage painfulness, is suffering, and it makes you glow, and one cannot exist without the other. I think. This entry was posted in psychology and tagged Douglas Harding, epistemology, Han van de Boogaard, Masha Halberstad, Susan Blackmore, Terence Mckenna, The Prodigy. Bookmark the permalink.